-> The angle of climb (slope) is the angle between the horizontal axis and the aircraft flight path. 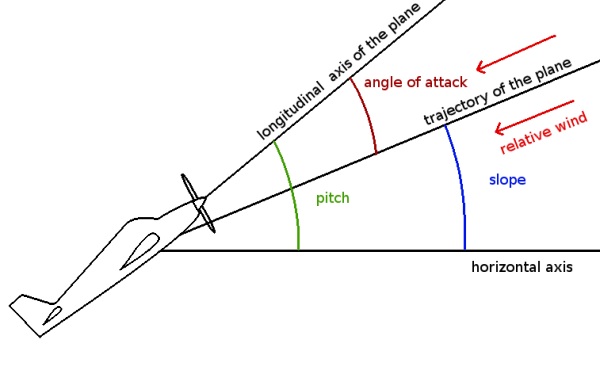 -> The pitch is the angle between the horizontal axis and the longitudinal axis of the aircraft. 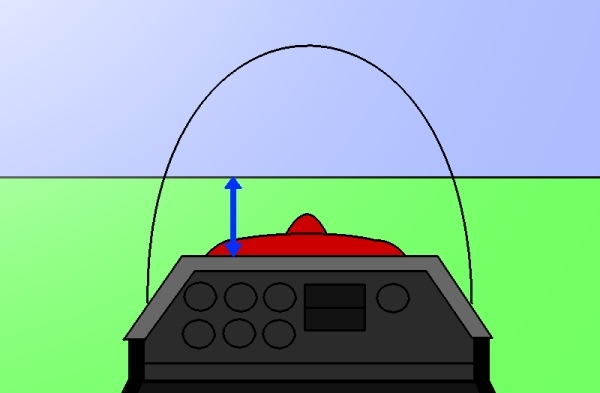 One of the most simple techniques to visualise the pitch while flying is to look at the position of the hood of the plane. -> The angle of attack is the angle between the trajectory and the longitudinal axis of the aircraft. The plane follows the trajectory path and so the air incoming on the aircraft (relative wind) comes from the same direction of this axis but in the opposite way (see the scheme). So we can say that the angle of attack is the angle between the relative wind and the longitudinal axis of the plane. To do so, you will have to maintain the trajectory of your plane superimposed to the longitudinal axis. At this moment : the angle of climb = 0 and so the pitch = the angle of attack. That's it for the basic definitions ! I hope that you have understood these notions because they are necessary to understand what is coming next. Don't hesitate to take your time and read this chapter again if you haven't understood because we will soon enter into the thick of things ! See you on the next chapter when you are ready !